In honour of Canada Day, I'll set aside the flood talk, in order to review a fine Canadian book I recently read. Full disclosure - I am a huge Miriam Toews fan. From the moment I first cracked the cover of A Complicated Kindness way back in 2004, she has enchanted me with tales of complex and quirky female protagonists dealing with the world through small acts of rebellion. 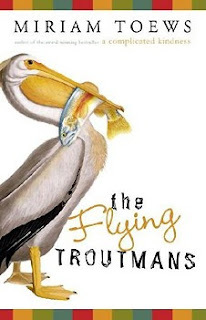 So I fully expected to be completely absorbed in The Fying Troutmans. I was not disappointed. In Paris, newly dumped by her boyfriend, Hattie receives a phone call from her adolescent niece that her mother (Hattie's sister) has spiraled into depressive catatonia and that the eleven-year-old is not capable of looking after her anymore. Hattie arrives to find hyper-talking Thebes and her silent and morose fifteen year-old brother Logan dealing with a house that is crumbling around down around them, while screening calls from school. With no other family members she can turn to, and with her sister dispatched to a psych ward, Hattie quickly realizes that she is in far over her head. In desperation, she hatches an ill-advised scheme to take the kids on a road-trip in their battered old Aerostar van to track down their long-lost father. It's a long shot at best, the only lead being his last known address - a small town in South Dakota. The road trip that ensues is fraught with mishaps and dumb luck. It's an adventure that is held together with hope, duct tape and desperation and peopled by (in vintage Toews fashion) some of the most loveable, damaged and quirky characters you could hope to spend 274 pages with. These are people whose only resources are resilience, pluck and determination to carry on because what other options do they have. Thebes is totally irrepressible. She seems completely unaware of just how weird she is and while, at eleven, she can still get away with her weirdness being cute, your heart breaks for her a little at the thought of the pain she is going to go through in a few years. Logan, expelled from school and non-communicative, shows himself to be surprisingly insightful and kind, as the miles peel away his layers of armour. Hattie, who punctuates the miles rolling by with reflections of the troubled relationship she shares with her sister, is a terrible role-model to the kids. And yet, she is exactly what they need right now. The Flying Troutmans is, at its heart, the story of a family who is doing the best they can with what life has thrown at them. You will remember them for a long time. I'm still undecided about Toews, but I do like a good road trip book. I agree with you that Toews is a master of quirky characters. I find her books stick with me as well after I have read them. I do too! You should give this one a try then, John. They are quite memorable, Kathy, nicely layered. The book sounds quirky, but I wasn't a fan of a Complicated Kindness. Although maybe I'll give the author a chance again at some point. This is the only book I've read by Toews so far, but I just loved it too! I'm a big fan of quirky characters. I must get around to her other books. You may not enjoy this if you didn't like A Complicated Kindness, Jules, because they do share a certain sensibility. But hopefully I am wrong about that! I'm really glad to hear that, Nicola! I highly recommend all her books, then!